With so many images from the past effecting today's fashions I have taken inspiration from the 1930's and created this art deco necklace. 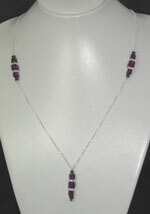 This necklace is made up of amethyst swarovski cubes in graduated sizes. These cubes have been interspersed with square rondelles each with swarovski ab stones glistening around them, the pink colours from the rondelles work perfectly with the purple of the swarovski cubes. A run of the crystal cubes run down each side of this necklace 28" sterling silver chain necklace.The 1.5" drop is a repeat pattern of the necklace design but held to the chain with a swarovski headpin complete with a purple swarovski stone at the end of it. This necklace would compliment this seasons wide trouser look first seen in the 1930's.